San Diego’s safe streets supporters love when the City of San Diego studies altering the streetscape of dangerous auto centric roads. Unfortunately, even when safety is the stated priority of the study, safety and encouraging bicycle infrastructure are not a priority. The typical roadway conditions of El Cajon Blvd are relics of San Diego’s auto centric past. El Cajon Blvd was the east-west corridor before Interstate 8 was completed in the 1960’s. When the I-8 was completed, the City of San Diego did not retrofit the redundant auto centric nature of the roadway. The result was a high speed, dangerous road through the heart of San Diego’s Mid-City neighborhoods. The dangerous conditions of the roadway made it an ideal candidate for safety improvements. In 2015, the city began a study, “Complete the Boulevard,” to identify improvements to “realize the transformative potential of the Rapid Bus and future Bus Rapid Transit (BRT) along State Route 15 in Mid-City by creating more walkable, bikeable, and transit- friendly locations along the Rapid Bus route.” The area of study was El Cajon Blvd. from Highland Ave. to 50th St. The existing conditions report confirmed what anyone who choose to walk or bicycle on ECB already new, it was unsafe. The corridor had 188 traffic crashes previous 5 years, 36 of those collisions involved a pedestrian or bicyclists. In studying the corridor, city staff observed bicyclists often choose sidewalk rather than the intimidating streets. In fact, city staff analysis determined that only the “strong and fearless” (<1%) demographic of bicyclists would tolerate the streets. This data confirms what bicyclists already knew: El Cajon Blvd is a terrible place to ride a bike. 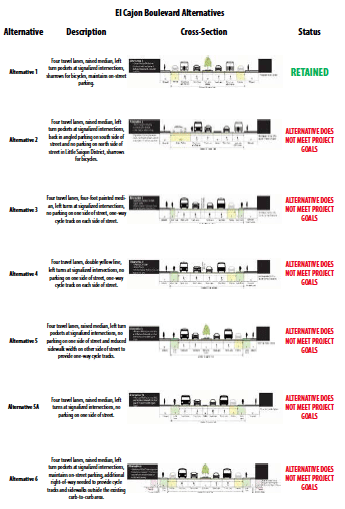 Based on the need identified in the existing conditions, City staff prepared analysis of alternative roadway design. Most alternatives were dismissed quickly. Staff determined only 2 alternatives viable. 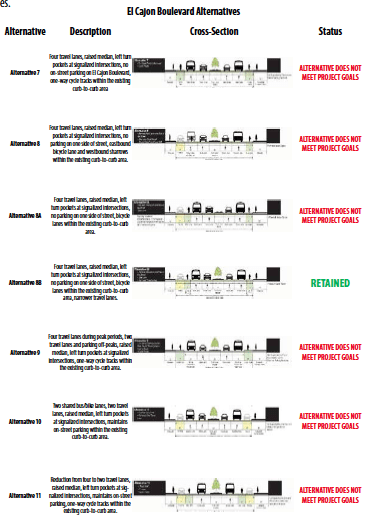 Alternative 1 adds a center median to limit the conflict points created by automobile turns. No dedicated bicycle facility for Alternative 1. Alternative 8B includes dedicated bicycle lanes on both sides of the street. Alternative 1 received vocal support at both community planning groups (CPGs), Kensington-Talamadge and City Heights Area Planning Committee (CHAPC). While these group’s opinion is only advisory, it appears that city staff will cave to their demands. Why did these CPGs not want dedicated bicycle lanes on unsafe road? (Perceived) Lack of parking!! This contradicts city staff’s analysis of the current parking, showing that the current parking is underutilized and unmetered. Clearly a more efficient use of the on-street parking would offset any space lost to the addition of bicycle lanes. The excess of parking combined with City Heights resident’s low levels of car ownership should have promoted the alternatives that included bicycle lanes. In a city that has both adopted Vision Zero goals and a binding Climate Action Plan, it is troubling that bicyclists concerns are dismissed.